Figure 5-27. - Timing gauge. 1. The governor speed control lever should be in the IDLE position. If a stop lever is provided, secure it in the STOP position. 2. 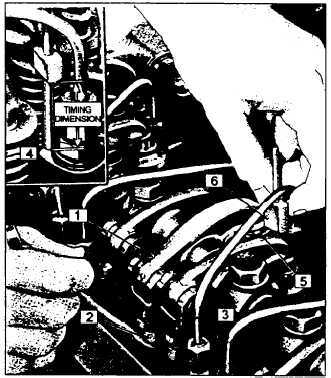 Rotate the engine crankshaft, using an engine barring tool, until the exhaust valves are fully depressed on the cylinder that you wish to set the injector. If a barring tool is not available, a 3/4- inch-square drive socket set with a suitable socket to fit over the crankshaft pulley will also do. 3. Insert the small end of the timing pin (gauge) into the hole provided in the top on the injector body, with the flat portion of the gauge facing the injector follower. 4. Gently push the gauge by holding the knurled stem with the thumb and forefinger towards the follower. There should be a slight drag between the gauge and the follower. 5. If this cannot be done, loosen the injector pushrod locknut and adjust it until the drag of the gauge (slight feel) has been determined. Hold the pushrod and tighten the locknut. Recheck the feel, and, if needed, readjust. 6. When hot setting this adjustment, wipe off the top of the injector follower and place a clean drop of oil on it. When properly adjusted, the gauge should just wipe off the oil film from the follower when the slight drag is felt. 7. Time remaining injectors in the same manner. Since all the injector racks are connected to the fuel control tube and then to the governor by the fuel rod or rods, they must be set correctly. This ensures that they are equally related to the governor. Their positions determine the amount of fuel that will be injected into the individual cylinders, ensuring equal distribution of the load. Failure to set the racks properly will result in poor performance and a lack-of-power complaint. Adjusting the inner and outer adjusting screws on the rack control lever (fig. 5-27) equalizes the injectors. This is a rather delicate adjustment. and it may be necessary to make these adjustments several times before the engine operates just right. To increase the amount of fuel injected, loosen the outer adjusting screw and tighten the inner adjusting screw, thereby moving the control rack inward. To decrease fuel injection, loosen the inner adjusting screw slightly and tighten the outer adjusting screw which moves the control rack outward. In making the operating adjustments, never turn the adjusting screws more than one-fourth turn at a time; for if one injector is adjusted too far out of line with the others, it will prevent the full travel of the racks and reduce the maximum power to the engine. NOTE For exact procedures for adjusting the injector rack control levers, refer to the manufacturer's service manual. Sometimes smoother engine operation can be obtained by making slight changes to the adjustments after the engine is warmed to operating temperature (above 140F). For example, one cylinder may not be carrying its share of the load as indicated by a comparatively cooler cylinder. Therefore, the control rack should be adjusted for more fuel. A slight knocking noise from another cylinder would indicate an adjustment for slightly less fuel.